This is a summary for Brinley’s 43rd week; she was 42 weeks old. This week, Brinley tried bread. And she LOVES it. Mmmm…bread. You know how she does the peek through the crib slats and wave bye to me thing? Well, one day I was putting her down about 5 minutes before Brayden’s friends were supposed to start arriving for his birthday party and I totally forgot to wave bye. I got a few steps from the door when she started crying in that offended way. I thought for a second and realized what I had done! So I went back to the door and did the wave thing. Then she was fine. Don’t break the routine! Ha. Brinley is turning out to be quite obedient naturally. She listens well and does what I tell her to. When she has something in her mouth (which happens way more often than I think all of my other kids combined ever had happen–the challenge of a fourth child! ), I tell her to spit it out and she does immediately. 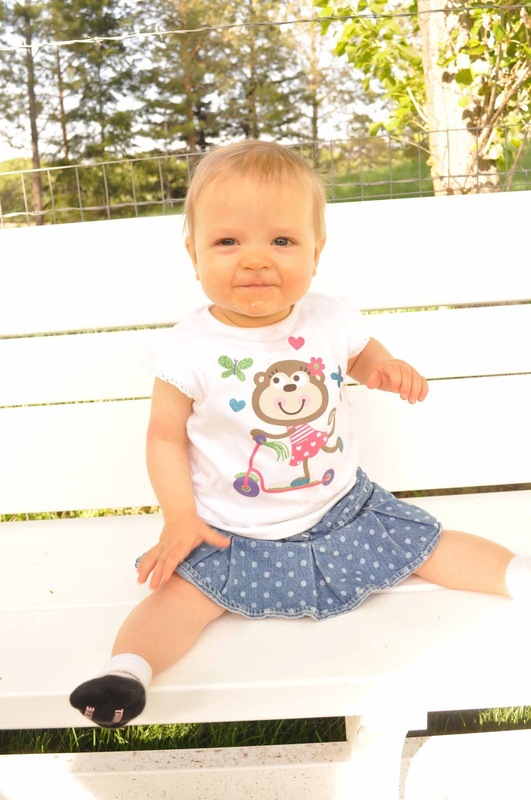 Brinley seems to love adventure–like in the swing outside, she wants to be pushed high. My other babies I just lightly swung, but Brinley wants to be pushed as high as I might do a toddler. She squeals and giggles and laughs with joy. I love hearing about the children's differences. So interesting! Raven if you click on the "Blog Index" at the top of the page, scroll down to the "Baby Summaries" link and click on it. You will then see a list of summaries for McKenna and Brinley. McKenna is first, then Brinley's. Brayden and Kaitlyn i didn't do summaries for, so their schedules are under "schedules" and "sample schedules 0-12 months"
Mum is so gentle and Careful for the life of baby!RS moneyexpecially for the Newborn baby! Earn working with accumulating your bones your dollars. To have this performed, go to Ing Kharid. Prior to the contract price tag wall you might study a lot of people teach. Accumulate mainly because numerous bone fragments as opposed to to coach on till your merchandise is usually comprehensive. Then go for the Grand Adjust in Varrock then sell on them linked with 84 rs gold just about just about every. Should you destroy flock all through the farm, grab the feathers then sell on these around spot corridor.